Nowadays, there are no days, when people gather on any occasion to spend time for dull feasts, and the entertainment to eat festive dishes is no more popular. After all, you can have fun! However, not all active games can please all guests. In this case, we can turn to sports board games. This is an excellent alternative to active rest, giving much fun and enthusiasm. 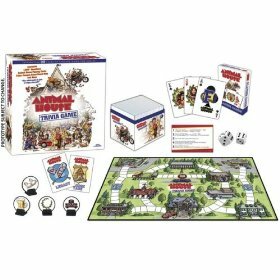 The Collectibles of the Game store offers a large selection of non-sports and sports table games for exciting leisure time at any season of the year. The assortment of our products includes stadium puzzles, DVD games, sport puzzle and much more. Having such a game at home, you no longer need to think about what to do with unexpected guests - the decision of fascinating free time activity is always with you! Playing these games, you can fully immerse yourself in the gameplay, forget about the problems and feel like the main character in the new universe you created. Games will give you a lot of pleasant impressions and positive emotions, and also will bring you closer to your friends.